This page is my attempt to establish a census of 1st-3rd issue double impressions. 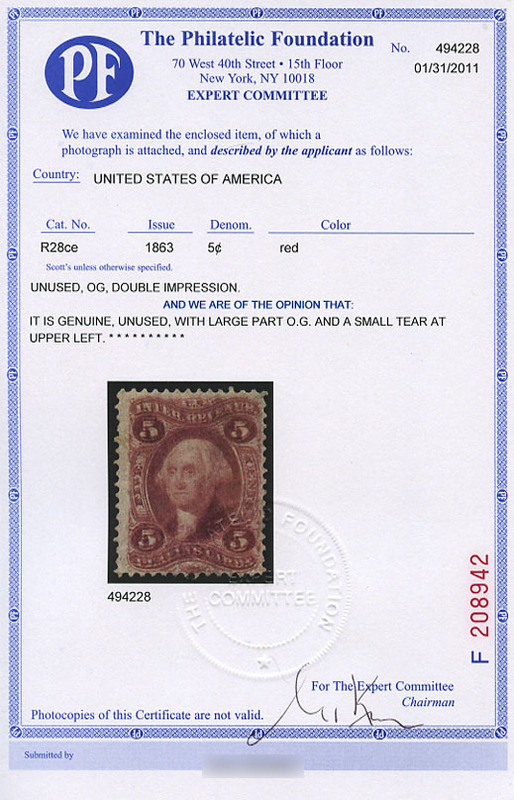 I have pulled examples from various auction archives, the Philatelic Foundation archive, dealer stocks, my own collection, and submissions from other collectors. For reference purposes, I am also including possible and partial double impressions. 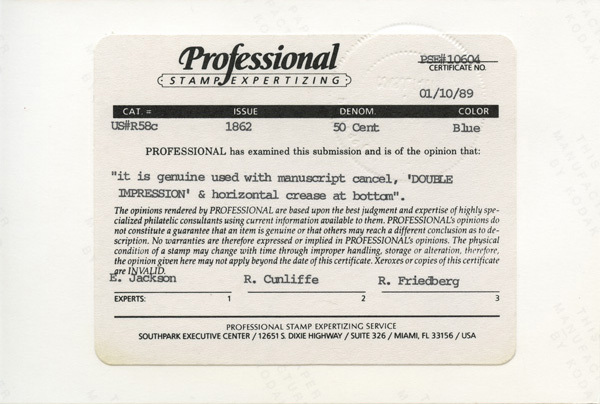 Scott catalog numbers for double impressions have changed over time, so I am listing them by the base Scott number, but then including mention of the different numbers the stamps have been catalogued under. If you own, or know of, any 1st-3rd issue double impressions not shown on this page, please contact me. Images courtesy of Jim Drummond. Image courtesy of Jim Drummond. John W. Kaufmann Auction 58. October 18-19, 1979. 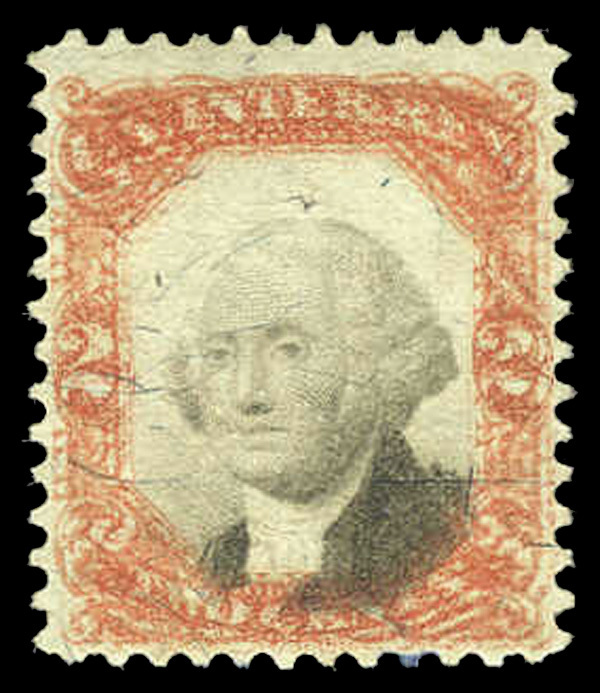 Lot 307. Spink Shreves Sale 103 (The Robert H. Cunliffe Collection). June 26-27, 2008. 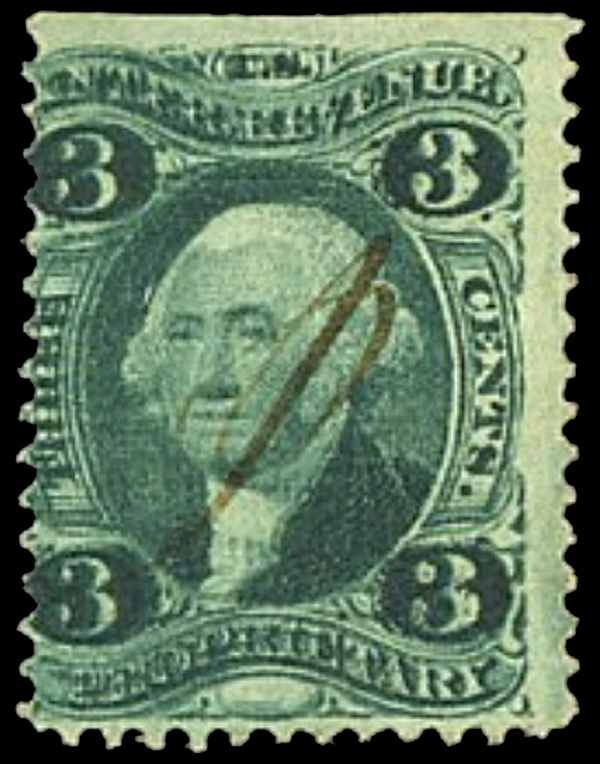 Lot 382. Spink Shreves Sale 108 (Collectors' Series Sale). January 29-31, 2009. 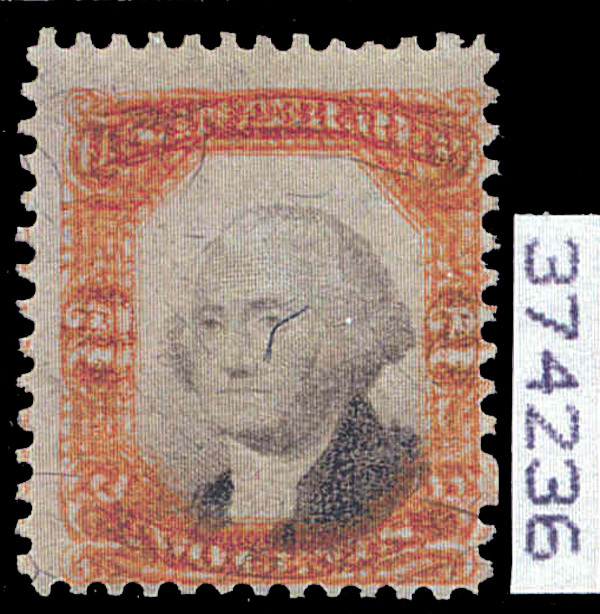 Lot 874. Siegel Auctions Sale 1066 (The Wildhorse Collection). March 24, 2014. 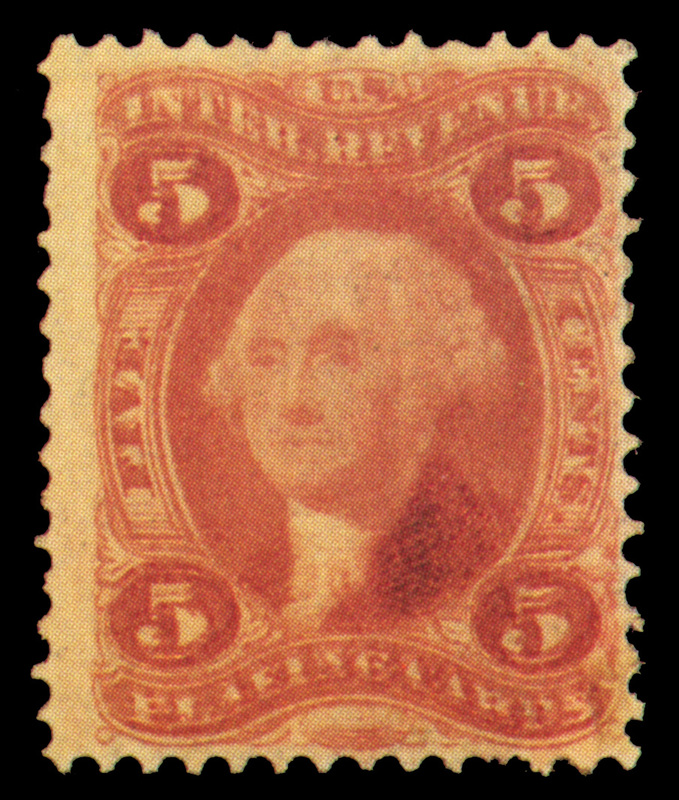 Lot 61. 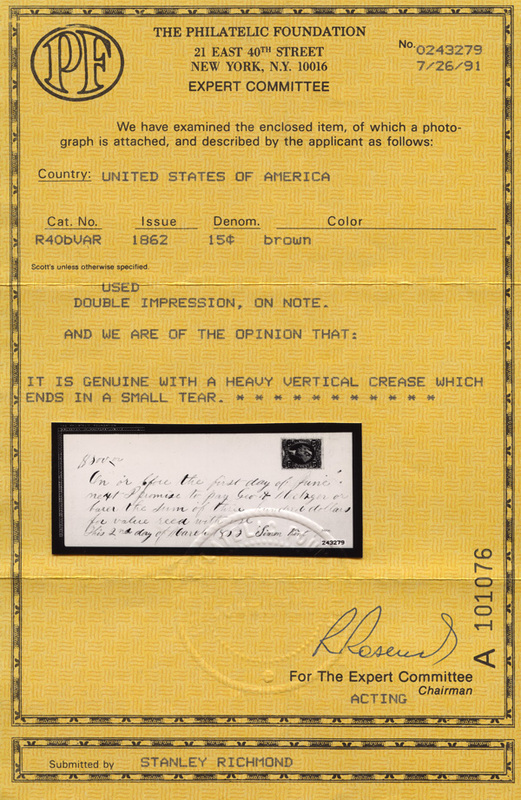 Daniel F. Kelleher Sale 589 (The Morton Dean Joyce Collection). June 4-6, 1991. Lot 2099. 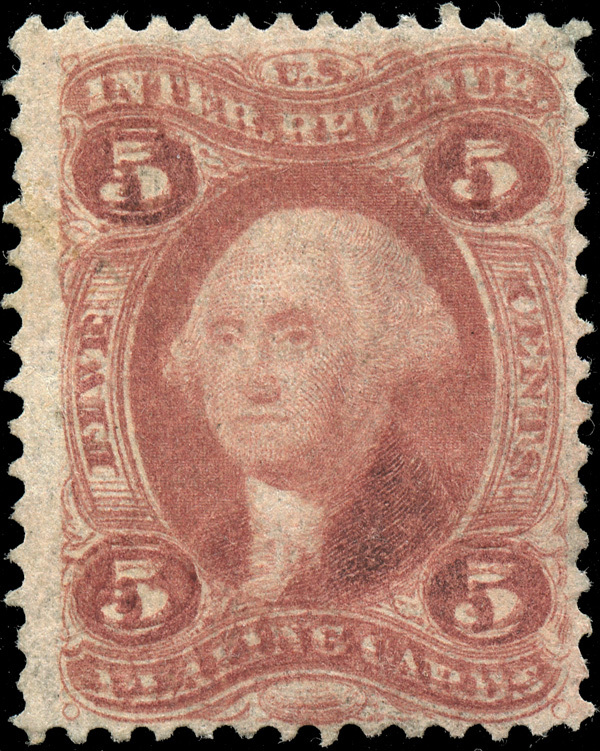 Spink Shreves Sale 53. October 18, 2002. Lot 1316. 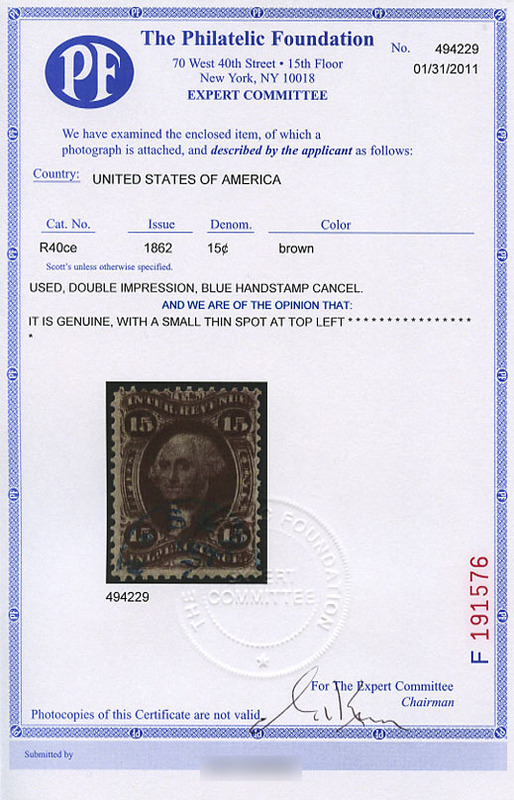 Image courtesy of Stamp Auction Network. 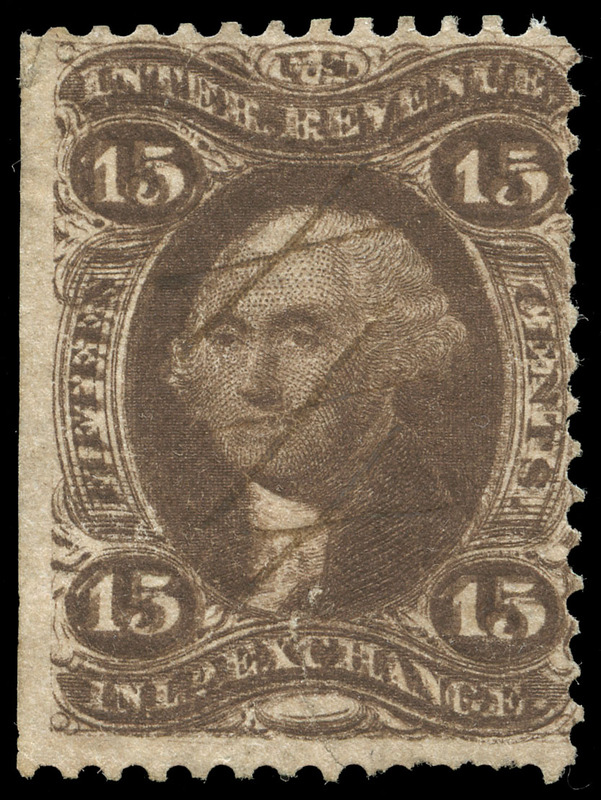 Spink Shreves Sale 122. March 10-12, 2010. 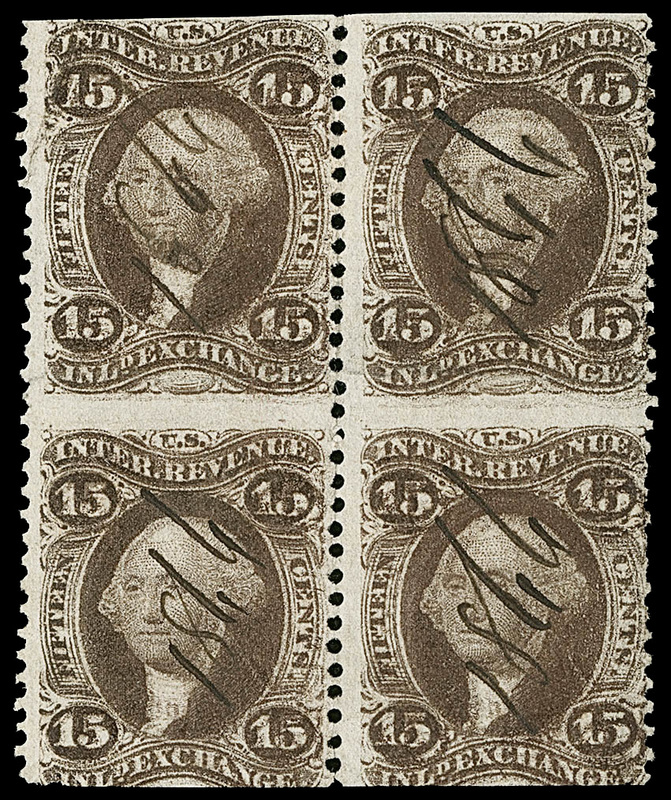 Lot 1038. Variety Listed in Scott? Yes (R28e) Priced in Scott? 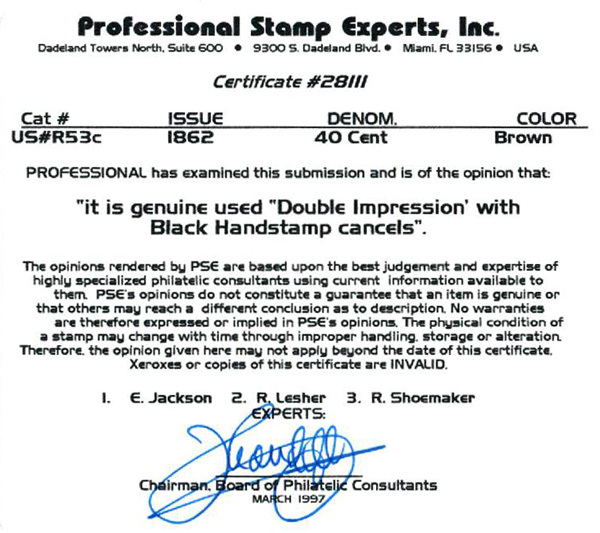 $1,200.00 Expertized? 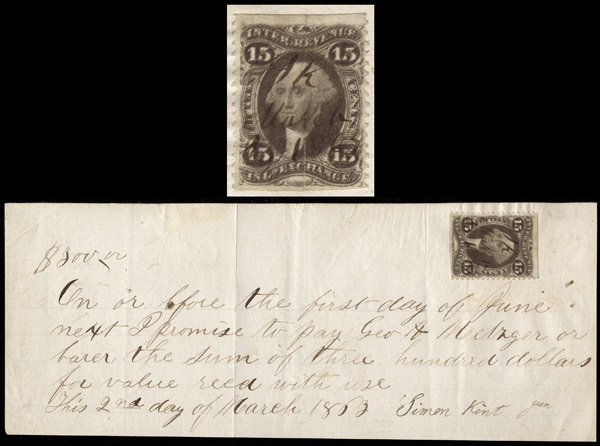 Siegel Auctions Sale 1066 (The Wildhorse Collection). March 24, 2014. Lot 63. Image courtesy of Siegel Auction Galleries. Variety Listed in Scott? Yes Priced in Scott? 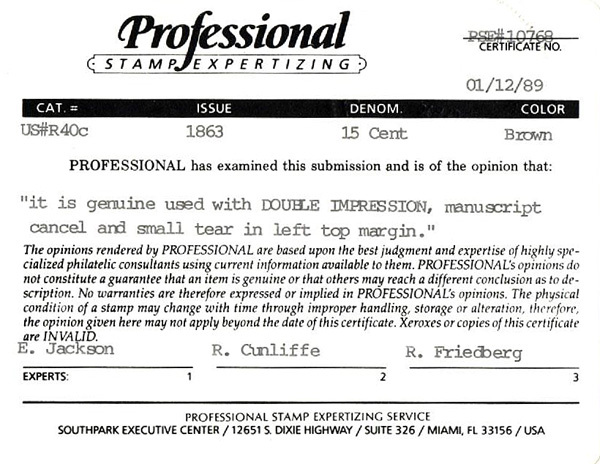 $1,200.00 Expertized? 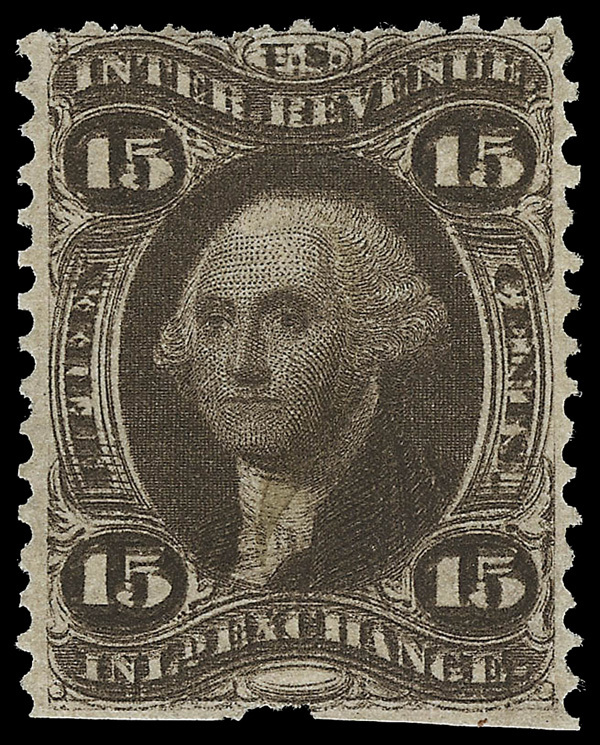 Siegel Auctions Sale 934 (The Henry Tolman II Collection). May 9, 2007. 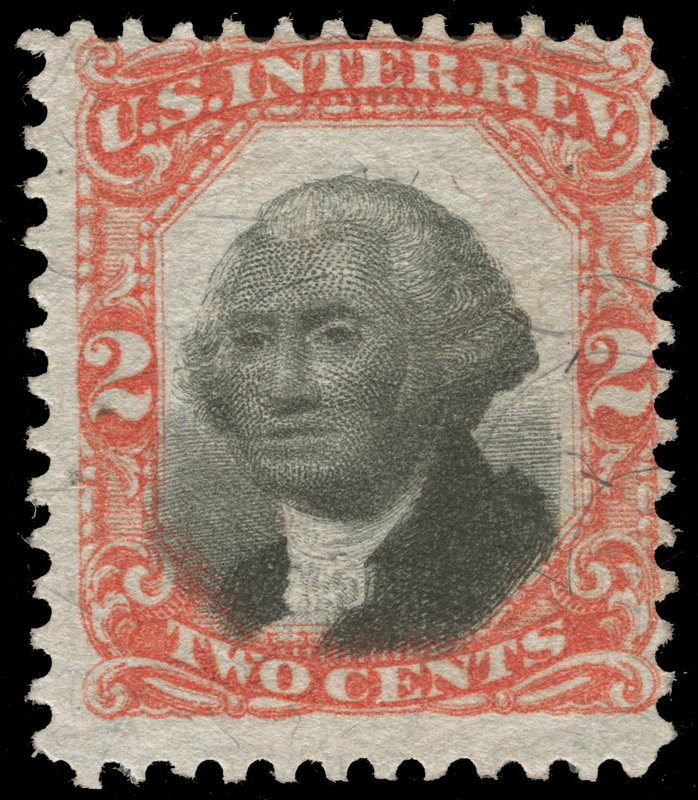 Lot 2202. Michael E. Aldrich Auction #32. October 14, 1990. 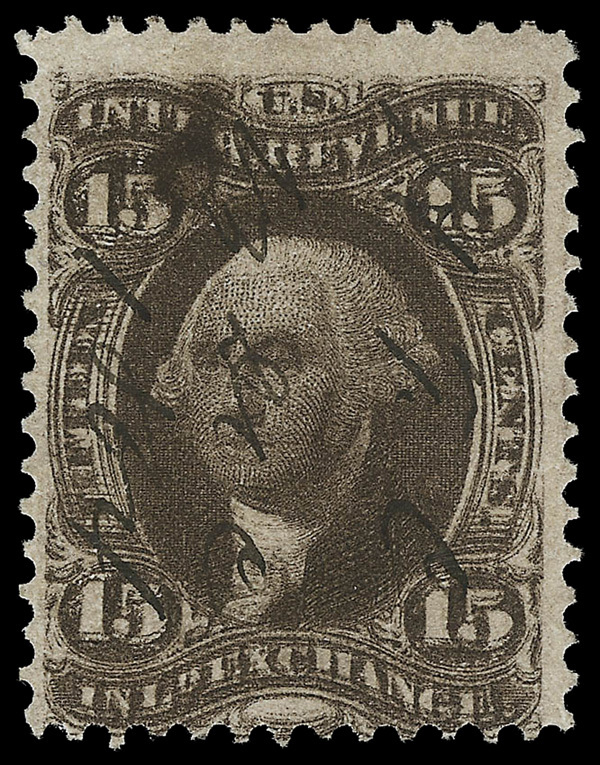 Lot 141. 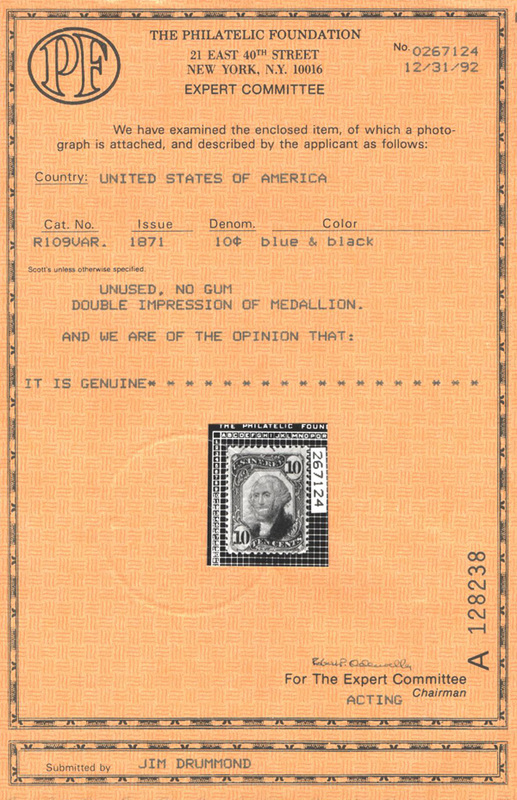 Image courtesy of Michael E. Aldrich Auctions. Daniel F. Kelleher Sale 589 (The Morton Dean Joyce Collection). June 4-6, 1991. 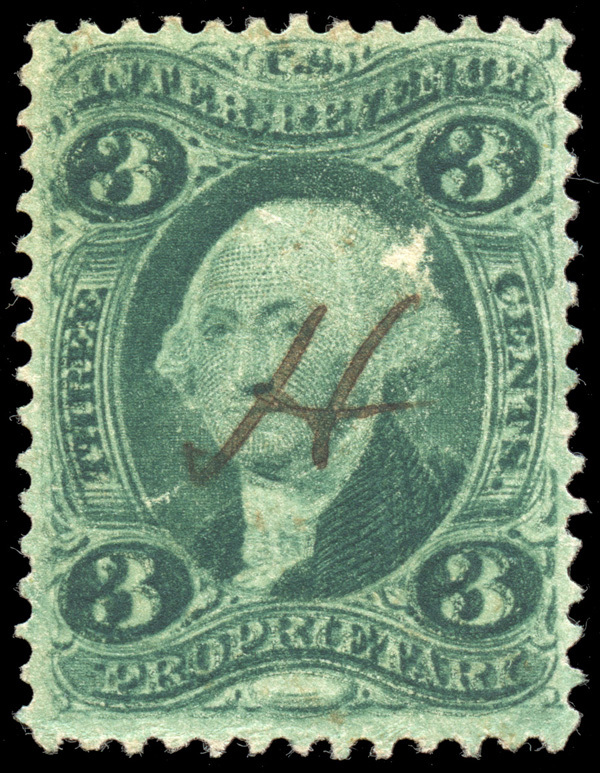 Lot 2132. 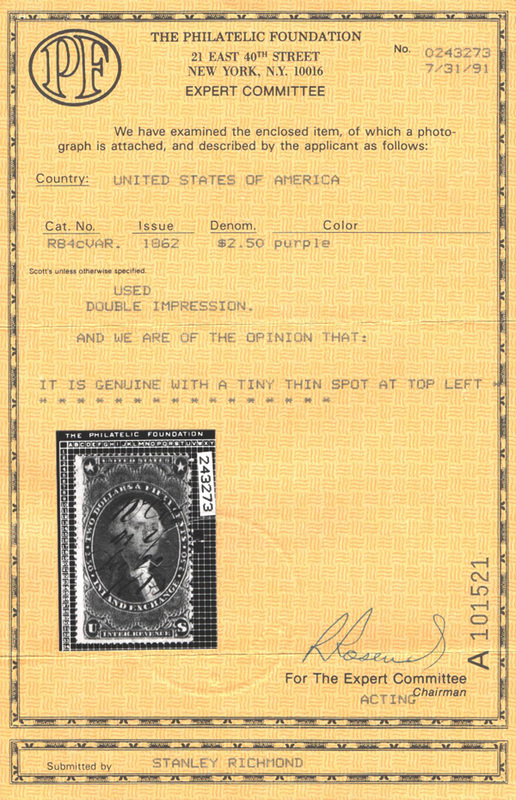 Image courtesy of Daniel F. Keller Auctions. Siegel Auctions Sale 1089 (The Curtis Collection). December 16, 2014. 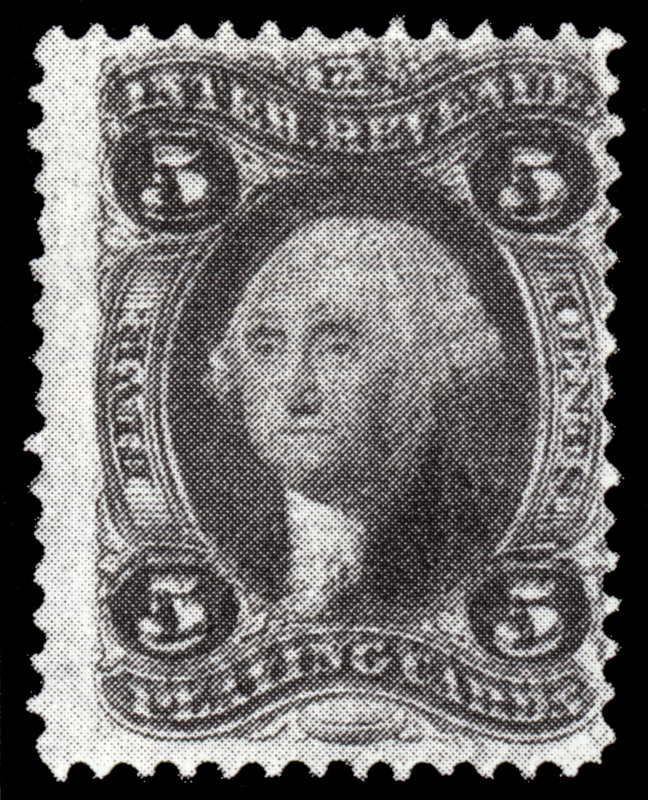 Lot 295. Michael E. Aldrich Auction #25. June 6, 1987. 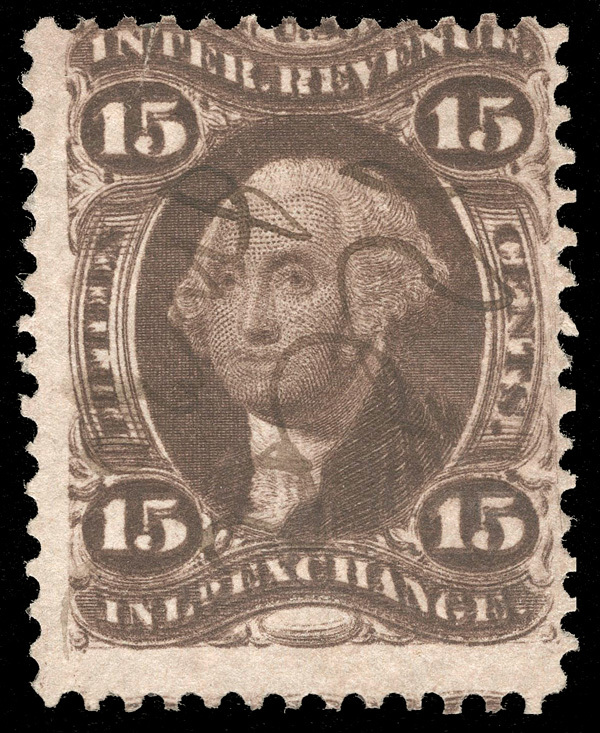 Lot 163. Variety Listed in Scott? Yes (R40e, R40be) Priced in Scott? $1,900 (for a single) Expertized? 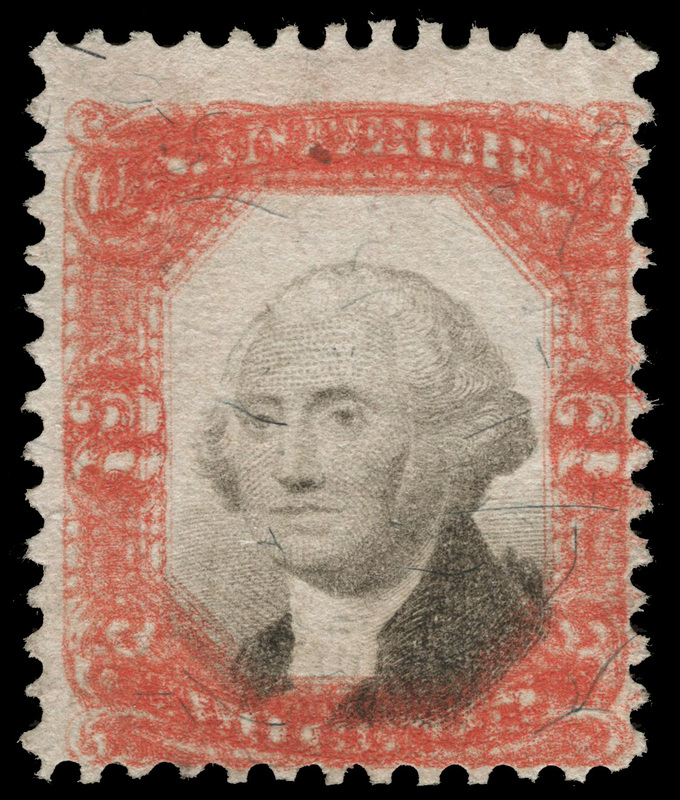 Spink Auction Galleries Sale 103 (The Robert H. Cunliffe Collection). June 26-27, 2008. Lot 329. 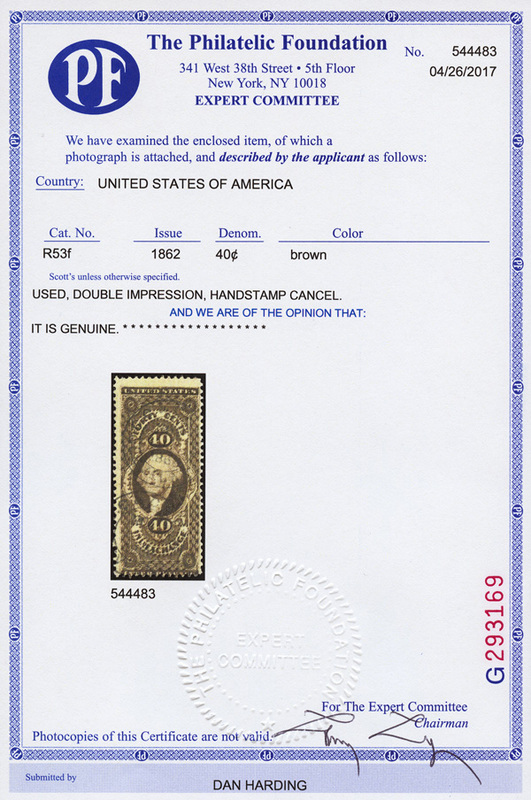 Image courtesy of The Stamp Auction Network. Variety Listed in Scott? Yes (R40f, R40ce) Priced in Scott? $750.00 Expertized? Siegel Auctions Sale 1066 (The Wildhorse Collection). March 24, 2014. 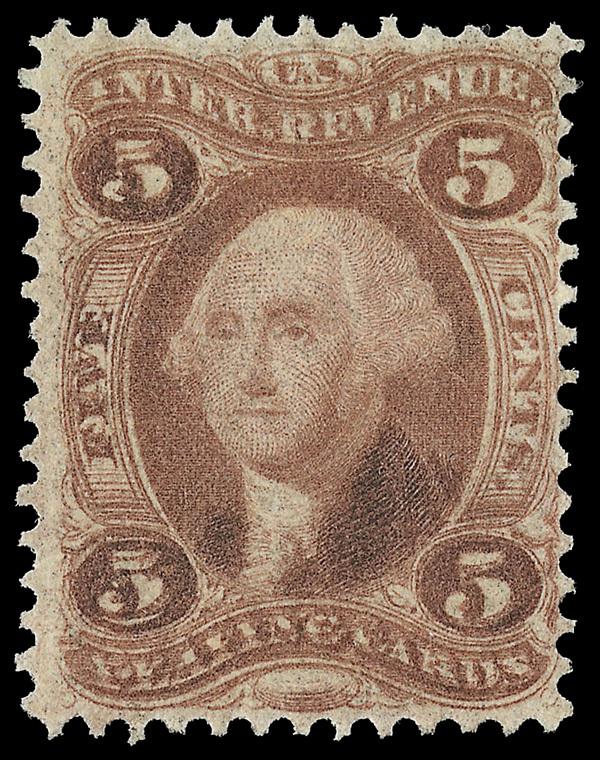 Lot 65. Daniel F. Kelleher Sale 589 (The Morton Dean Joyce Collection). June 4-6, 1991. 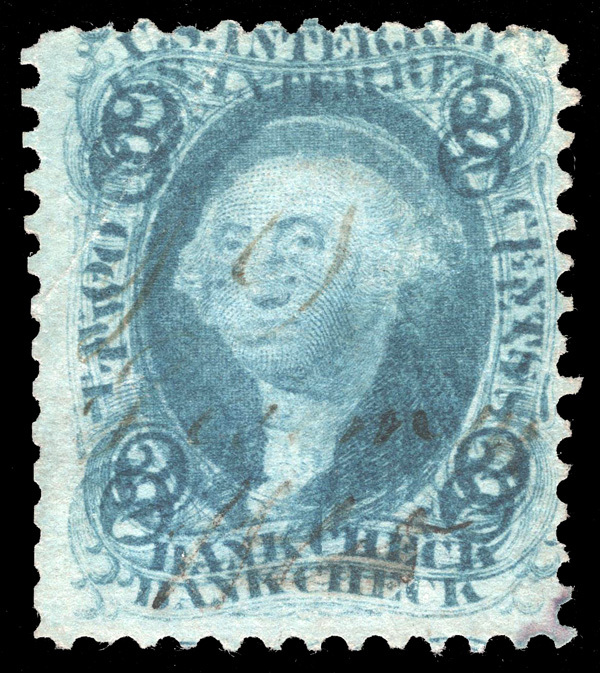 Lot 2156. 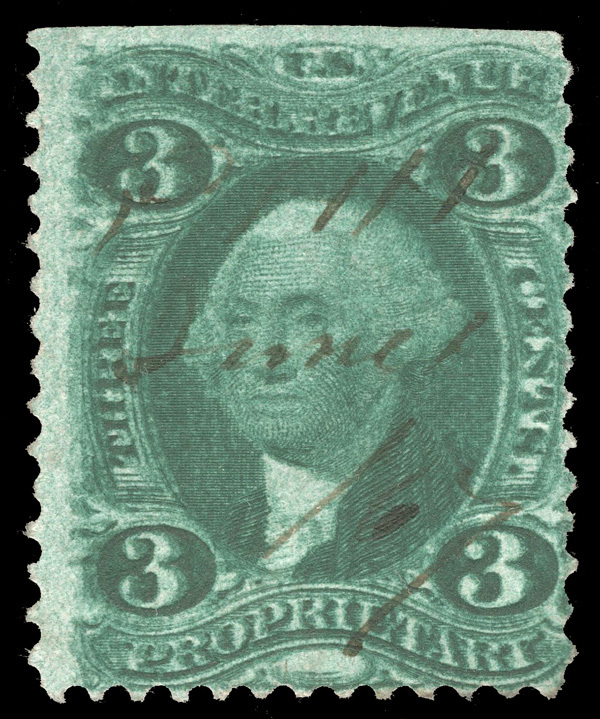 Siegel Auctions Sale 953. March 25, 2008. Lot 1766. Michael E. Aldrich Auction #32. 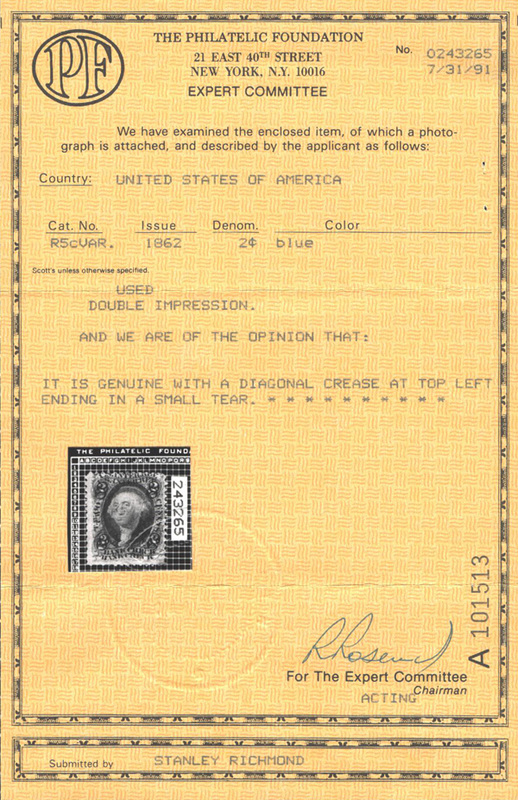 October 14, 1990. 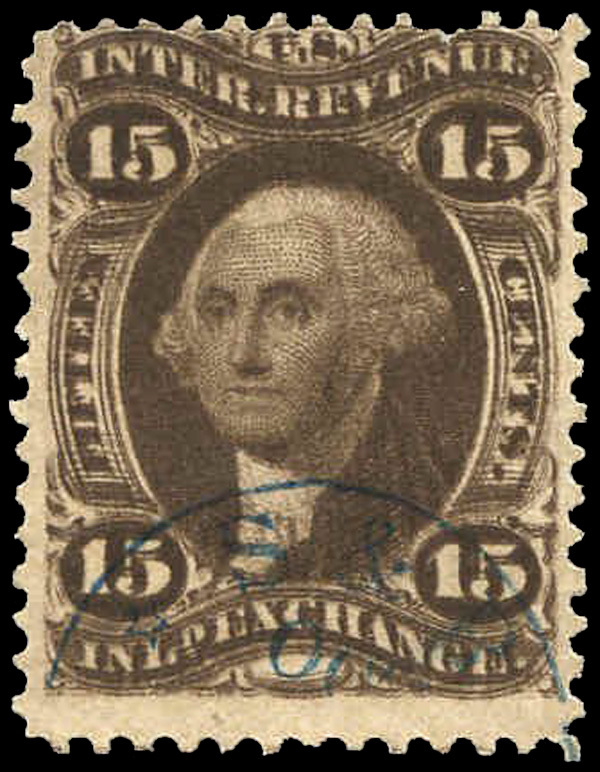 Lot 163. Variety Listed in Scott? Yes (R46e, R46ce) Priced in Scott? $500.00 Expertized? Siegel Auctions Sale 1066 (The Wildhorse Collection). March 24, 2014. 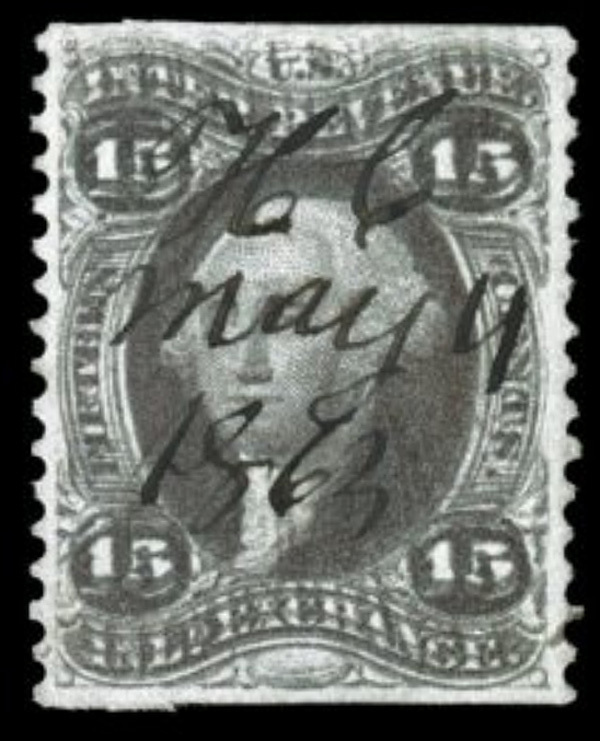 Lot 68. Daniel F. Kelleher Sale 589 (The Morton Dean Joyce Collection). June 4-6, 1991. 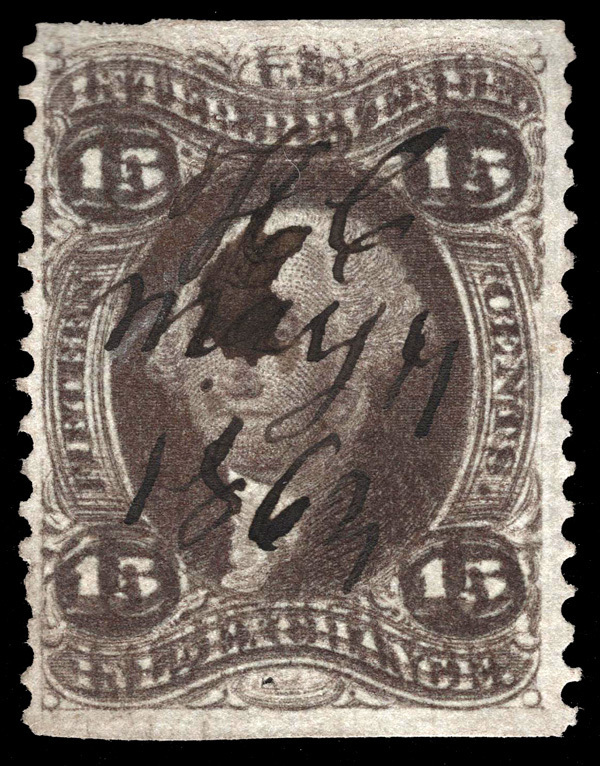 Lot 2165. Spink Shreves Sale 53. October 18, 2002. Lot 1319. Daniel F. Kelleher Sale 589 (The Morton Dean Joyce Collection). June 4-6, 1991. 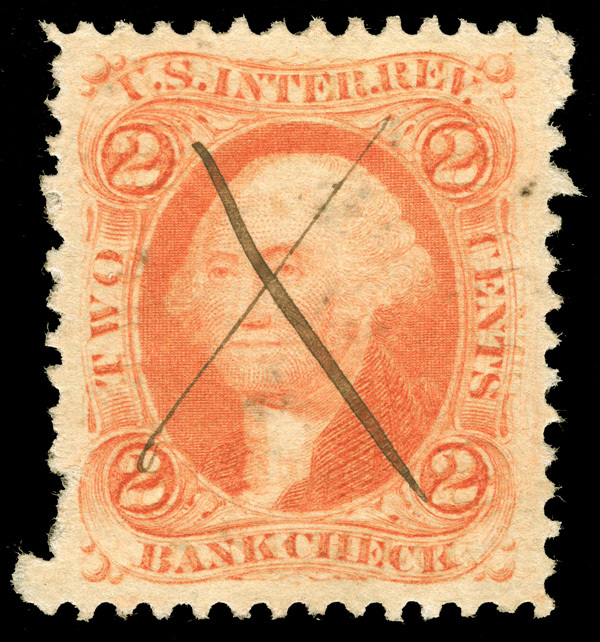 Lot 2164. 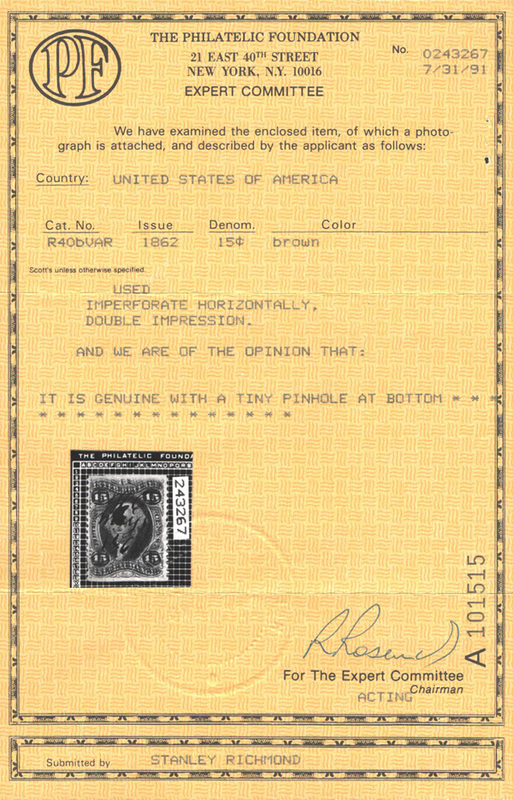 Image courtesy of Daniel F. Kelleher Auctions. 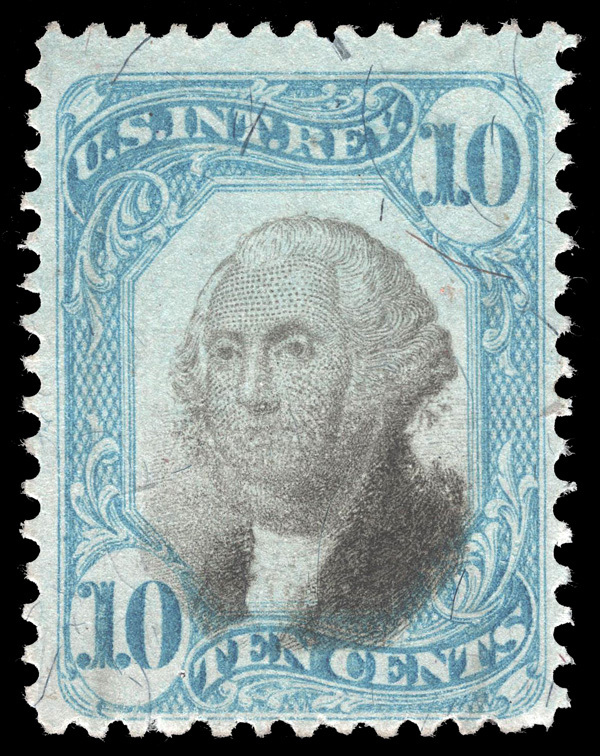 Spink Shreves Sale 103 (The Robert H. Cunliffe Collection). June 26-27, 2008. Lot 441. Daniel F. Kelleher Sale 589 (The Morton Dean Joyce Collection). June 4-6, 1991. 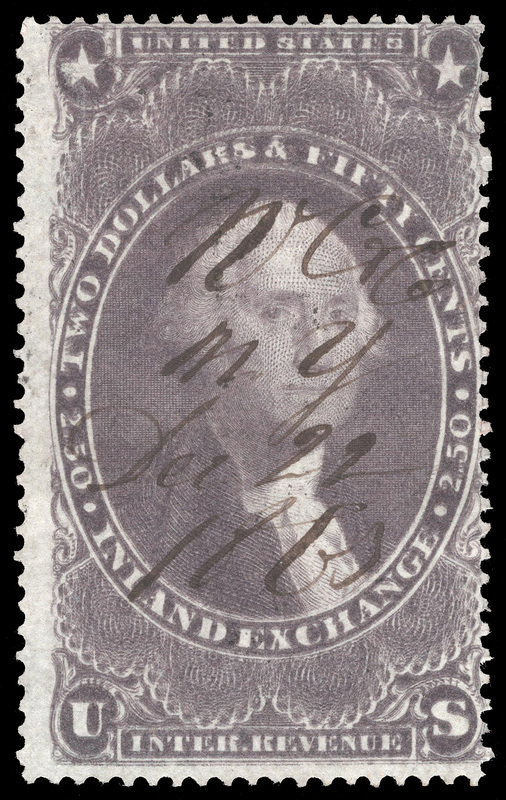 Lot 2184. Daniel F. Kelleher Sale 589 (The Morton Dean Joyce Collection). June 4-6, 1991. Lot 2228. 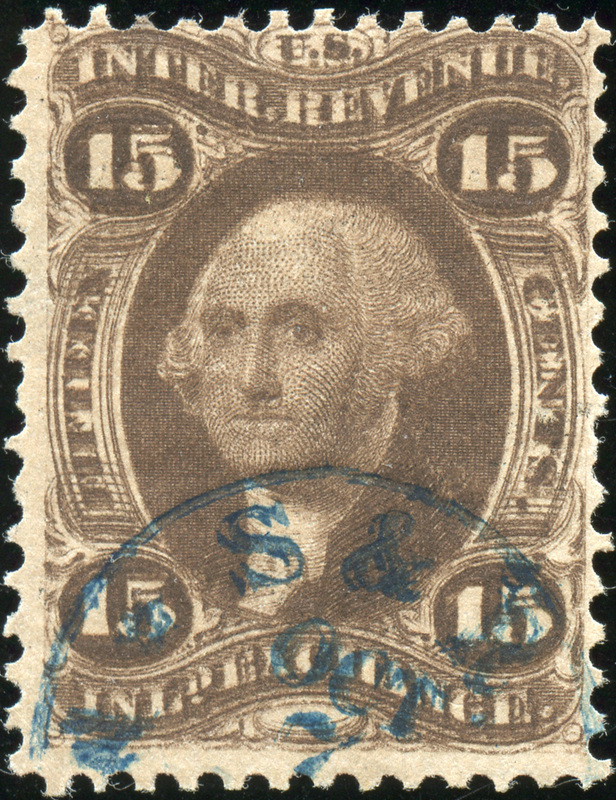 Spink Shreves Sale 103 (The Robert H. Cunliffe Collection). June 26-27, 2008. 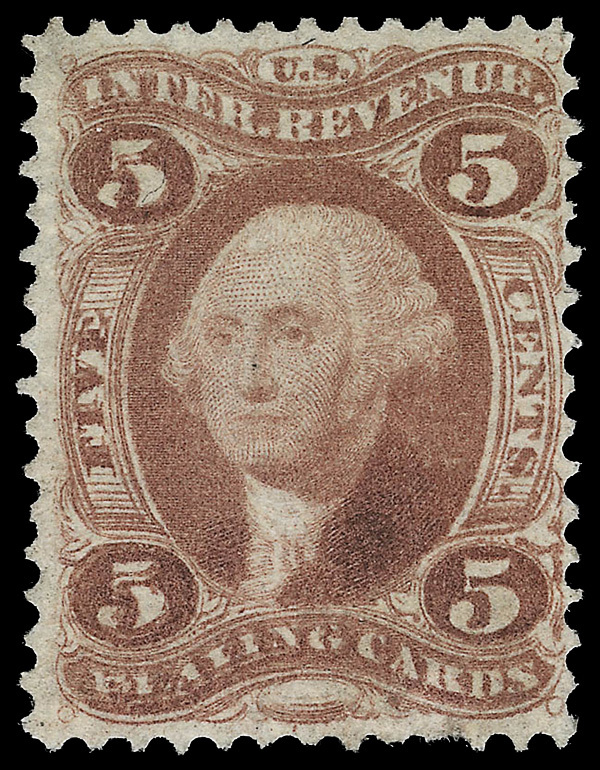 Lot 617.